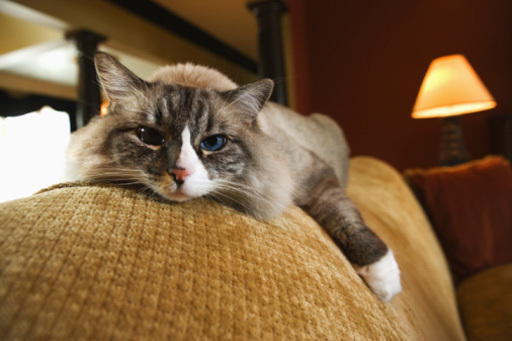 Ask Dr. Pawz: How to get a lazy, fat cat to lose weight? In this week's Ask Dr. Pawz, Katy Nelson shares what you can do to get your cat to lose weight and how to tell the age of an adopted pet. WASHINGTON – In this week’s Ask Dr. Pawz, Katy Nelson shares how to tell the age of an adopted pet and what you can do to get your cat to lose weight. Dear Dr. Katy – I have a Pomeranian I rescued. I adopted him at the Howard County Animal Shelter, but they could not tell me how old he is. Is there a way for me to find out? First off, congratulations on the adoption of your new pup! This is a great question, but unfortunately not one that I can give you a solid answer for. If your little Pom is a puppy, then a close estimation can be made prior to the age of 6 to 8 months as the permanent teeth all come in at certain times. However, after all the permanent teeth come in, you’re left with an educated guess. Have your veterinarian examine your little rescue, and he or she can give you a good estimate of your Pom’s age based on your pup’s teeth and the rest of the physical exam. You will still likely end up with a range, but that’s better than not knowing at all. Our second question comes to us from Edgardo Anon via email to askdrkaty@wtop.com. Dear Dr. Katy – My wife and I have two cats. One of them is very overweight, and somewhat of a bully. The other is very small, but my veterinarian says he is a normal weight. We would like to find a way for our overweight cat to lose weight, but she doesn’t like to exercise and she rarely lets our thinner guy get to the bowl and tends to eat all the kibble we put out. Do you have any advice for how to get a lazy, fat cat to lose weight when the only exercise she gets is beating up her skinny brother? This is one of the most difficult situations that owners in multi-cat households face. The bully cat pushes the skinny cat away from the bowl, eats the majority of the kibble and continues to gain weight. This is not a quick fix, and it is not going to be simple to correct, but this is fixable if you put your mind to it. First thing you need to do is to talk with your veterinarian about switching your cats over to a canned diet to be fed in a precise and pre-measured amount. Your veterinarian can help you to calculate the appropriate amount for each cat to eat each day. It is convenient to feed dry foods, but cats are obligate carnivores who require protein to feel full. Feeding them a dry diet high in carbohydrates doesn’t keep them feeling full, so they continue to eat and they continue to gain. Plus, there is no way at all to gauge how much your pet is eating when there is an endless supply available. Second step is to begin taking steps to create timed feedings and to feed each cat in a separate bowl so that you may monitor and control how much is being consumed by each cat. At first, you’ll have to allow plenty of time for the cats to get accustomed to their food not being out all day. For the first week, leave the food out for one to two hours, two to three times per day. Slowly, over a period of weeks or months, begin to decrease the time until your cats are aware that when you put the food out, they need to eat it or it will disappear. Finally, you will need to be patient. There will be days when you’re ready to give up and throw a bowl of kibble down for those kitties, but don’t do it. By putting up with a bit of a headache for a few weeks, you’ll be able to transition your kitties to a healthier lifestyle and help them to live longer, happier lives. I hope you’ll join me at Market Square in Old Town Alexandria in Virgina on March 2 for The Fun Dog Show. I’ll be serving as master of ceremonies and judge for the fun events on the docket! Afterward, we’ll head down the street to lead the Old Town St. Patrick’s Day Parade! Sign up at www.ballyshaners.org. Plus, I’ll be rocking the runway again this year for Fashion for Paws on April 13 at the National Building Museum to benefit the Washington Humane Society. I hope that you’ll all come out and support this fabulous event. WHS directly affects the lives of more than 30,000 animals each year in D.C. If you can’t attend, please support in any way possible. Every dollar counts!